Mix margarine or butter with sugar, add vanilla, baking powder, cinnamon, grind nutmeg, flour. You should get bulk mass. Spread 2/3 of mass in form, make small sides. Put form in the fridge. Combine curd with sugar, eggs, vanilla sugar, pieces of marmalade. Sprinkle the top with remained bulk mass and put in the oven for 30 min at 180 degrees. Take out pie, let it cool. 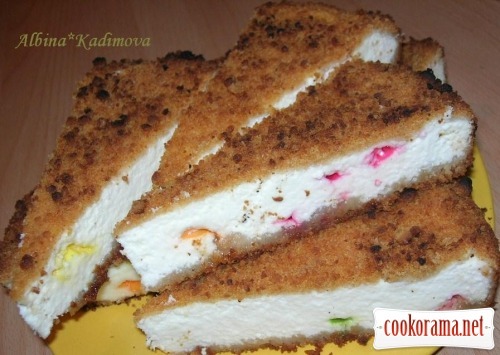 Top of recipe "Royal cheesecake with marmalade"
Симпатично и вкусно. Мне нравятся ваши рецепты с творогом.